Who'd have thought that munching on a head of cauliflower in front of Friday night TV could be so addictive? These moreish little bites will have you crying out for more. Use a vegetarian hard cheese in place of the parmesan if preferred. Or, for an Asian twist, try tossing the cauliflower pieces in 2 tablespoons of your favourite curry paste instead of the oil, paprika and cheese. 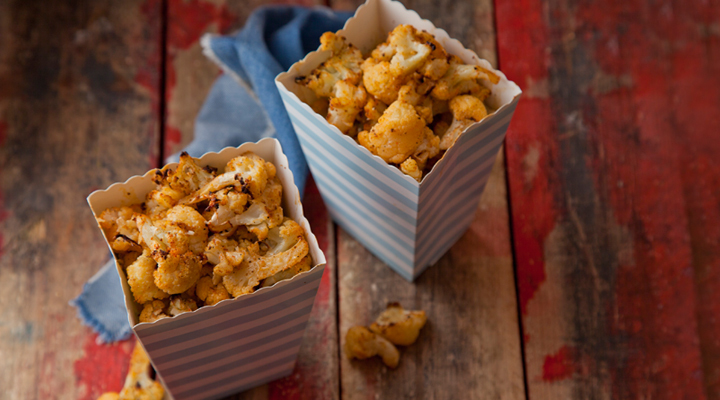 Trim the cauliflower and cut it into tiny florets, the size of popcorn. Toss in a large bowl with the oil, paprika, if using and some salt and pepper until evenly coated. Tip out onto a large roasting tray and arrange in a single layer. Bake in the oven for 30 minutes. Toss occasionally and sprinkle the cheese over for the last 5 minutes. The cauliflower should be golden and tender. Divide evenly between individual serving bowls or popcorn boxes and serve at once.